Newly commissioned Lt. Gen. U.S. Grant was today given an additional title: Commander of the Armies of the United States. He did not pick up the paperwork in person, though, as he was already in Virginia holding a rather touchy meeting with Gen. George G. Meade, who still held the title of commander of the Army of the Potomac. The two needed to work out ways to work together, as Grant planned to operate in the field with an army that had been commanded by Meade since just before Gettysburg. In fact the two worked out one of the great partnerships of the War when Meade, unlike his more egotistical predecessors, sent Grant a statement offering his services in whatever capacity Grant thought he would be most useful. In the end Grant kept him in command of the Army of the Potomac, which freed Grant from many onerous administrative duties. A blog by Southern writer and historian Dale Cox, Civil War Florida shares information on and discusses the events of the Civil War in Florida. Topics of interest include troops, battles, skirmishes, campaigns, raids, forts, naval actions, ships, soldiers, officers, books and historic sites. Having captured Fernandina and Amelia Island on March 4, 1862, the Union fleet next directed its attention to Jacksonville and St. Augustine. The Confederacy already had decided to evacuate positions all along its southeastern coast in favor of strengthening key points and developing an interior system of defense. The concept was developed by General Robert E. Lee of Virginia. He had not yet ascended to the command of the Army of Northern Virginia and was then commanding in East Florida, Georgia and the Carolinas. 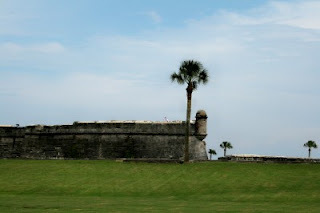 Unfortunately for Florida, Lee considered the nation’s oldest city of St. Augustine as not important enough expending resources for its defense. The troops there were ordered to load up their supplies and withdraw. And as had been the case at Fernandina, they did so just as the masts of the Union warships appeared on the horizon. …There is much violent and pestilent feeling among the women. They seem to mistake treason for courage, and have a theatrical desire to figure as heroines. Their minds have doubtless been filled with falsehoods so industriously circulated in regard to the lust and hatred of our troops. – C.R.P. Rogers, U.S. Navy, March 13, 1862. 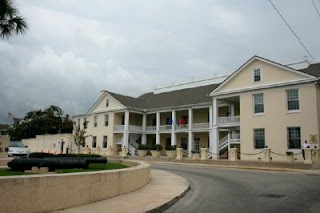 …On the night before our arrival a party of women assembled in front of the barracks and cut down the flagstaff in order that it might not be used to support the old flag. The men seemed anxious to conciliate in every way. – C.R.P. Rogers, U.S. Navy, March 13, 1862. The Union Navy would arrive in St. Augustine the next day. I will post on the 150th anniversary of that event tomorrow, so be sure to check back then. 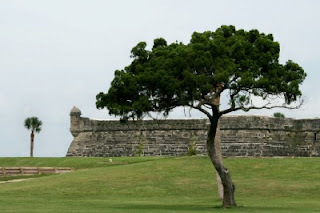 You can read more about the historic city of St. Augustine anytime at http://www.exploresouthernhistory.com/staugustine1. This entry was posted in Family History and tagged 150th anniversary, 1862, civil war, genealogy, history, places, U.S. Grant.